Like most of the comics-reading world, I discovered Kieron Gillen and Jamie McKelvie through their two Phonogram mini-series. I quite enjoyed the first one, although McKelvie’s art was still very raw (plus it was in black-and-white, and I prefer color). But I couldn’t get into the second one, The Singles Club, which was a set of short stories with thin characterization and minimal plot. McKelvie’s art had reached A-list quality by that time, so I’ve kept an eye on each of their work. That wasn’t hard to do, since the comics blogosphere loves them. Also, I’ve been quite enjoying Gillen’s run on Iron Man (though I bailed on his Avatar comic Über after about five issues). 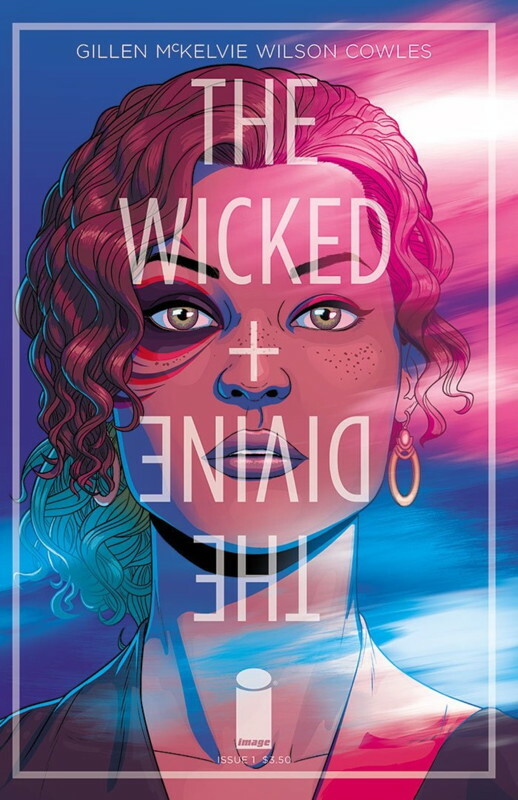 Their new collaboration, The Wicked + The Divine came out a couple of weeks ago to rave reviews. I enjoyed it, but I think it’s far too early to get tremendously enthusiastic about it. Well, except for the art – the art is fantastic. The premise is that there are a set of gods (at least 4, perhaps 12) who manifest in human form – apparently by taking over the bodies of actual humans – every 90 years, stick around for 2 years, and then die. We see their last incarnations’ final moments in the 1920s in the prologue, and then we jump forward to the present day where a girl named Laura is at a dance trying to become the host for the goddess Amaterasu. She’s not chosen, but afterwards she meets Luci, one of the other gods (bet you can’t guess which one). After an assassination attempt on the gods during an interview, Luci is put on trial, and everything goes to hell. Oh, and the art is fantastic, as I said. McKelvie still sports the clean line that’s characterized his art all along, but the 1920s sequence also shows a sense of form and shading reminiscent of John Cassaday – which isn’t necessarily better than McKelvie’s usual style, but shows a lot of flexibility. So color me cautiously optimistic. So there’s a lot of promise here. But if the series ends up being built around Gillen & McKelvie’s musical interests, or being clever in its pop culture references, then I expect it will lose my interest. It’s the gods and the game they’re playing that I’m here for. 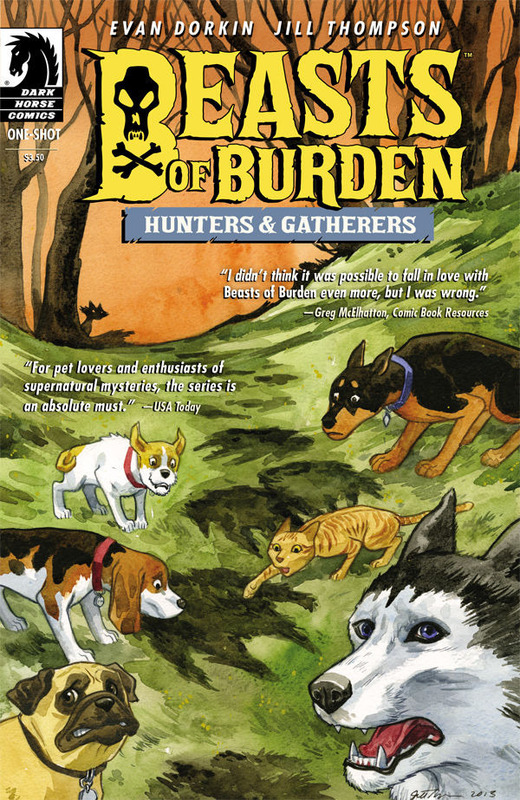 Reviewers often talk about “the best comic you’re not reading”, but I would bet that the very best comic you’re not reading is Evan Dorkin and Jill Thompson’s Beasts of Burden. The reason you’re not reading it is that it’s published sporadically. 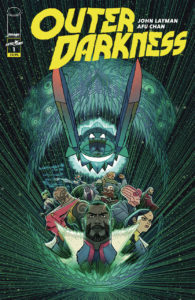 The original mini-series has been collected in a handsome hardcover, but otherwise the team has appeared in three issues of Dark Horse Presents, and now this one-shot. 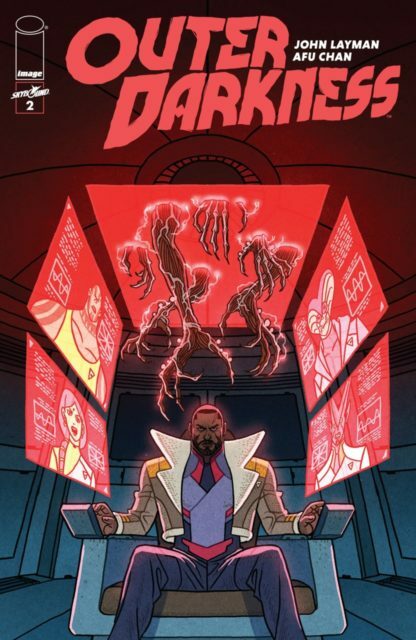 Despite the relatively high-profile creators – Dorkin having come to prominence with Milk and Cheese, Thompson probably best known for her Scary Godmother books – this series has been flying under the radar. The other reason you might not have been reading it is that it’s about a squad of animals who fight supernatural menaces, and you might not be interested in reading a comic about animals. But that’s underselling the premise, because what it’s really about is the culture of dogs and cats that Dorkin and Thompson have crafted, with a mix of characters from wise, almost shamanistic older dogs, to upstart, tough-talking younger pups, and the cat, Orphan, who hangs out with them. These animals live in suburban Burden Hill, and while we see several of them going him to their owners, and other pets who are domesticated and don’t get out much, the humans are part of the setting, not part of the story. The story in this one-shot involves the pack of dogs luring out an invisible monster, which is par for the series, although there’s been some character development along the way, too. The story does a great job of portraying the characters, some of who are deeply scared by their mission, while others are, well, not quite fearless, but certainly bolder. The best parts of the book is the end, though, where the pack makes the rounds of their neighborhood after finishing their adventure, which really shows the attitudes of some of the different animals in contrast to each other. The last page is a little ominous, and may or may not be setting up a longer-term story. Thompson’s art is brilliant, drawing realistic-looking animals who have expressions understandable by her human readers, without making them look cartoonish. The colors look like watercolors (see the cover to the left for a good example) and give the art additional depth and texture without overwhelming the layouts. This one-shot may not be the best jumping-on point for the series, but it’s worth a look if you can’t find the earlier collection. It might not quite be all-ages fare, but it’s pretty close. Certainly it’d be great if sales could get a boost so Dorkin & Thompson could afford to produce more issues more regularly. 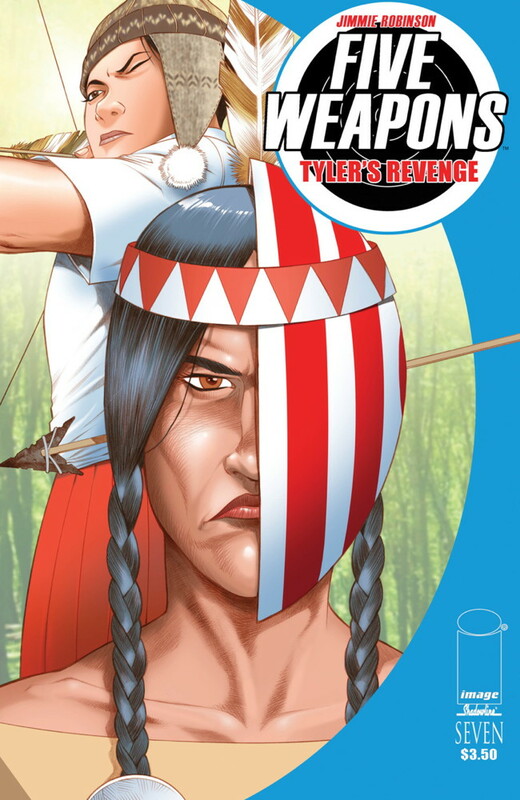 Five Weapons is the latest project by writer/artist Jimmie Robinson, who’s best known for the superhero satire Bomb Queen (which wasn’t my thing), and earlier for his science fiction adventure Amanda and Gunn (which I love and highly recommend). Five Weapons falls somewhere between those two series in tone, being a cleverly-plotted cliffhanger-driven drama, but with a quirky setting and regular doses of humor (some of which deliberately clashes with the more serious material). There’s not much quite like it on the market today. Five Weapons began life as a 5-issue limited series (collected), which I’ll now summarize – though since it ends with a plot twist, I’ll talk around that as best I can: Tyler Shainline is admitted to a private academy for aspiring assassins, on the strength of being the son of a famous assassin. The school focuses on skills with five different weapons, and the students are grouped into clubs around the weapons; Tyler is pressured into choosing to join a club. You’d expect that the series would show Tyler gaining mastery of all five weapons, but in fact he is a pacifist and refuses to fight with any weapon. The series’ formula is one of showdowns with the five club leaders, each issue ending on a cliffhanger where one wonders how Tyler is going to win this fight without actually fighting. Tyler is in fact at the school on a mission, which he completes at the end of the series, earning the respect of some of the other students. But, since he doesn’t actually plan to become an assassin, he leaves the school. The ongoing series starts with issue #6, where our hero returns to the school, this time as a medic training under the school’s doctor. However, one of the other students has a grudge against him and sets out to destroy his reputation and get him expelled. The two issues since still end on a “how’s he going to get out of this one cliffhanger”, but we no longer have confidence that he’s going to overcome his enemy, who’s about as clever as he is. This issue has him working out of one fix, learning some surprising things about a few of the adults, and then getting into another jam on the last page. While written in a straightforward, grounded manner, the setting of Five Weapons is bizarre, sometimes even surreal. There are several characters whom one might characterize as stereotypes, for example the teacher who heads the archery club, who is an American Indian (“Ms. Featherwind”). But for me, the weird thing – as you can see from the cover I’ve reproduced here, is that she has an arrow through her head, and a big target covering the left side of her head. It’s like something from a Batman or Avengers episode from the 60s, an affectation that doesn’t make much sense but sure looks weird. Characters in the series are full of this kind of thing, some of which are explained (the doctor is missing her nose and wears a bandage around her head to cover where it would be), some not. Additionally, for a school for assassins there isn’t a whole lot of assassinating going on, and there are a lot of students attending. The story alludes to missions that some of the adults have run, but there’s a general feel of “don’t look too closely at how this place fits into the world at large”. You’d think it would take a special kind of sociopath (or psychopath) to become an aspiring assassin as a teenager, but these kids don’t really show it. Indeed, I find the book enjoyable because the main character and his closer friends are all pretty easy to relate to. And because the cliffhangers in the story are enjoyable brain-teasers. 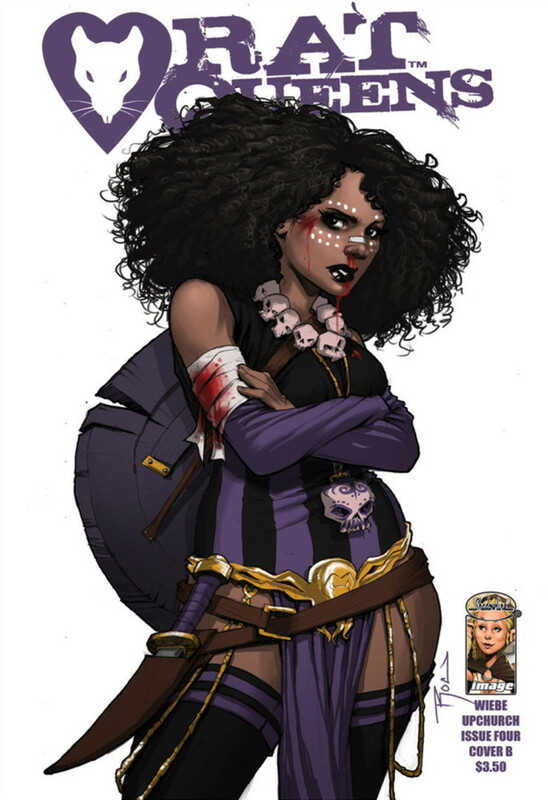 Robinson’s artwork is also quite strong, especially in his characters’ distinctive faces and expressions; it’s a long way from superhero comics. Yet the colors are bright and cheerful, also cutting against what would seem to be grim subject matter. It’s hard to tell whether Robinson has a long-term plan for the series, as the initial arc – presumably intended to stand on its own – felt complete in itself. Some notional 50-issue storyline would also seem out of place for this series, but we’ll see. Its internal artistic conflicts are part of what appeals to me about it; it’s got such a strong identity, yet that identity seems almost self-consciously fragile. Probably I’m overanalyzing it, as the overall feel is one of narrow escapes from danger in the most fun, adventuresque ways. 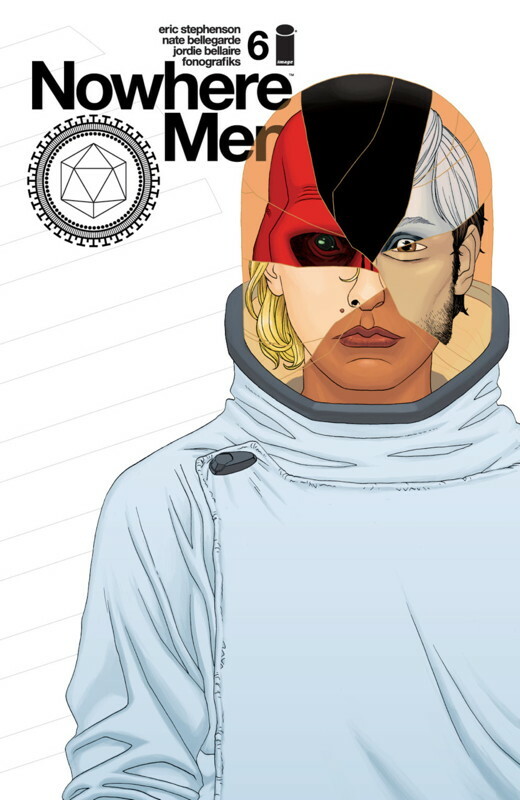 Nowhere Men is an interesting science fiction title from Image. It seems both the writer and artist have both been working for Image for a while (I’ve probably seen Bellegarde’s work in some of the Invincible titles, but I don’t remember it clearly), but Nowhere Men is different from anything they’ve worked on before. The core of the book is a quartet of scientists who formed a global corporation, World Corp, back in the 60s. The scenes from that era evokes imagery of the Beatles (the book’s title presumably comes from John Lennon’s similarly-named song), without there being an explicit match of the scientists to the original Fab Four. 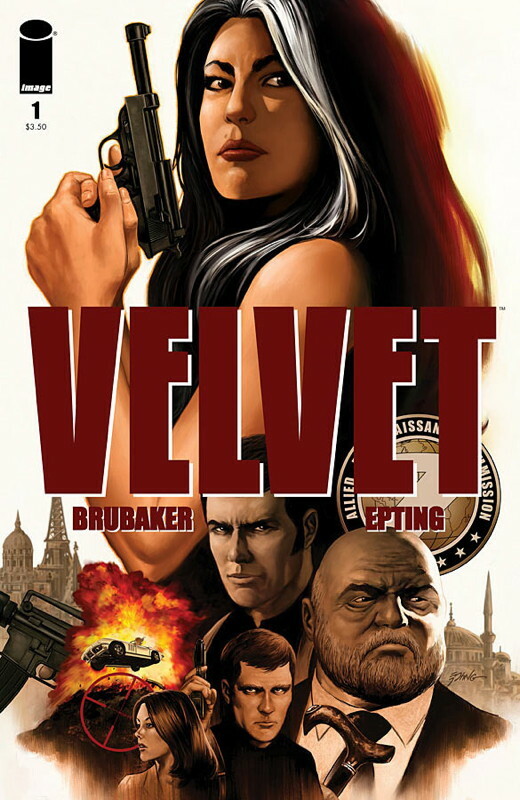 But most of the book takes place in the present day, where there’s an ongoing theme of the optimism and wonder of the founding of World Corp having rotted through: Emerson Strange, once a dashing man with long hair, is now old, bald, and seems crushed by the weight of running World Corp. Dade Ellis has spent years in a coma. Simon Grimshaw seems not to have aged, and has split from the other two with plenty of hard feelings. And Thomas Walker apparently succumbed to drug addiction and dropped out of society, not having been seen for years. Worse, experiments on a space station which Strange was overseeing have gone badly wrong, and the crew of the station barely managed to escape, while all being mutated in various ways (some of them grotesque). 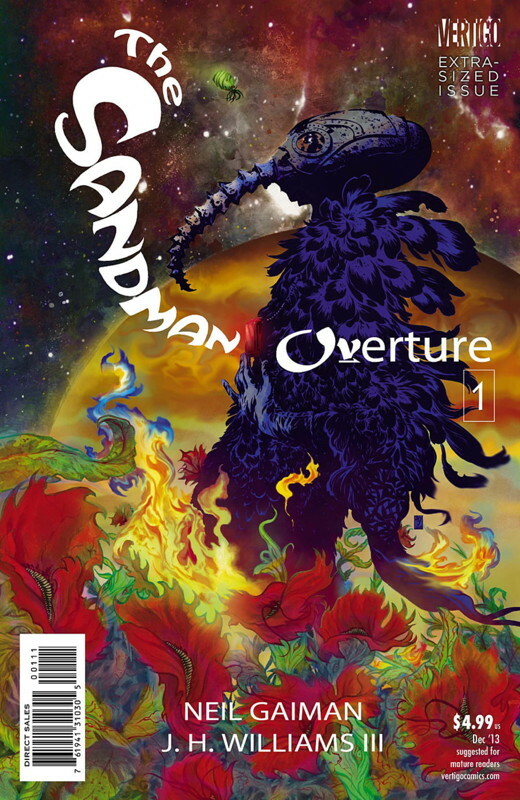 This issue features a confrontation among the station crew, Strange, Ellis and Grimshaw, in which all hell breaks loose. The World Corp founders clearly aren’t used to being challenged by people they regard as inferiors (both Strange and Grimshaw have huge egos, though Strange at least has some basic empathy), and whatever plans they’ve had in motion are clearly falling apart in the face of developing events. (There is at least one, perhaps two, loose cannons around, as well.) And what exactly happened to Thomas Walker is an ongoing question. 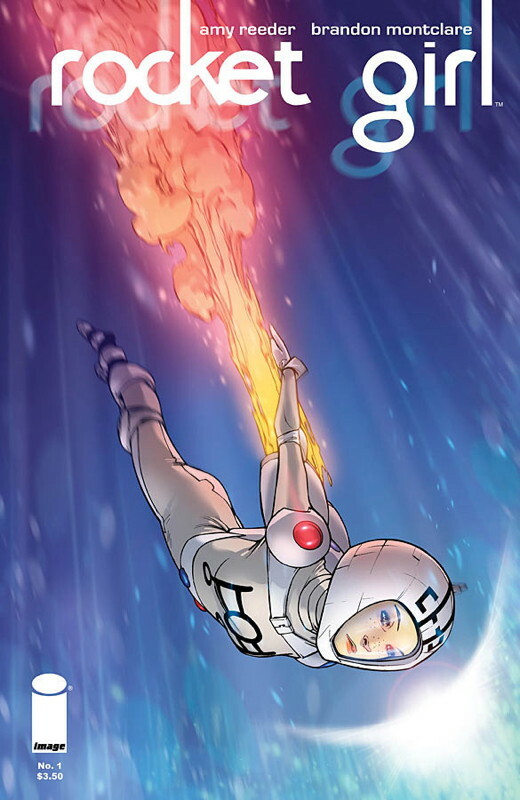 Nowhere Men contains several text pages in each issue, providing background on World Corp and their accomplishments over the years, often in the form of magazine articles and interviews. It’s surprisingly effective; I recommend reading the one-page piece at the start of this issue from start to finish, as it has a nifty kicker in the final paragraph. The book sometimes feels a little distant, like the founding members of World Corp are gods (the presumed irony is that Thomas Walker is perceived as having disconnected from the world but that he’s probably closer to it than the other three), and the hapless mutates from the space station are normal(ish) people caught in a situation beyond their control. That the story is largely concerned with the ongoing machinations of the principals, as opposed to smaller escapades of individuals, reinforces that feeling. Overall it works, but it is something of a sprawling epic which keeps barreling forward, rather than a careful character-driven narrative. It feels like the series is about half-done now, but the premise is so far-reaching I could imagine them doing more with it after this story is over. It helps a lot that Bellegarde’s art is outstanding, capable of both drawing ordinary people (with a diversity of faces and ethnicities!) and fantastic entities and effects. His clean linework and the effective colors by Jordie Bellaire make this one of the sharpest-looking books on the market. This particular issue isn’t easily read on its own, given the backstory, but the first six issues will soon be collected, with the appropriate title “Fates Worth Than Death”. I recommend it when it comes out. With this week’s publication of Earth 2 #16, I’m dropping the last three comic books I’ve been buying set in the DC Universe . This despite the fact that it ends on a cliffhanger, but with writer James Robinson leaving, it feels like a good point to jump off. Earth 2, World’s Finest and Batgirl. Where DC and I have parted ways is that they clearly are interested in pushing their characters, whereas for me it hasn’t been about the characters for years, it’s been about the creators. I follow the creators I’m interested in, and I want to find people with interesting voices and novel stories to tell, and stories that are going to develop their characters and go somewhere. I don’t really know what’s going on in DC editorial, but stories like the creators of Batwoman leaving the book after not being able to have their heroine marry her girlfriend reinforces my perception of it being all about the marketable properties for them. Setting them up for movies and TV shows, I guess (that being where the big money is). And, well, I don’t care about that. The recent Batman films were good because of Christopher Nolan, not because they starred Batman. So this is goodbye. Not necessarily forever – I’m still buying several Vertigo books and creator-owned titles that DC publishes such as Astro City. But the New 52 is clearly the culmination of plans that DC editorial has been brewing for years, and it’s just not resulting in the kinds of comics that I want to read.